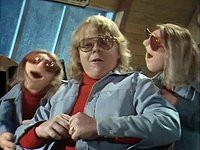 The Paul Williams episode was nominated for an Emmy for Outstanding Writing in a Comedy-Variety or Music Series. 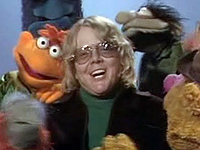 This marks the beginning of Paul Williams' collaborations with the Muppets. He would later write the music for "Emmett Otter's Jug-band Christmas," "The Muppet Movie" (and provides a cameo), and "The Muppet Christmas Carol". Twenty-five years later, Paul would be the special guest star at the Muppets' first fan convention, MuppetFest, where he participated in a panel discussion and played a special grand finale medley during a live performance of "The Muppet Show". Fran Brill, the main female Muppeteer at the time, makes her Muppet Show debut in this, her first of only two episodes. 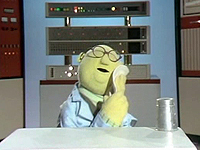 Dr. Bunsen Honeydew's design was reportedly based on Sir Lew Grade's appearance. 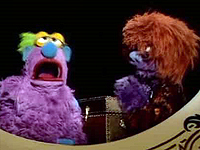 During the first season of The Muppet Show, Bunsen would be working alone in the lab. His assistant Beaker will debut in Season Two. Mary Louise must love frogs! She'll sing with them again in the Sandy Duncan and Steve Martin episodes. Having been mercilessly heckled by Statler and Waldorf in his monologues, the writers start to experiment with Fozzie's comedy spot, sensing it may not be working. Last week, Fozzie did impressions and this week he does a duo scene with Scooter. With a few exceptions, the rest of Fozzie's monologues this year will follow their standard format but Fozzie will also start to be used more in sketches and backstage plots in order to salvage the character. In later seasons, Floyd and Janice would become a couple, but in the show's first season, Janice would often be paired with Zoot! In this episode, they appear together in "At the Dance" and "Rowlf's Poetry Corner." Especially in these early episodes, Zoot is featured quite a bit, perhaps due to Jerry Nelson's fleeting availability as Floyd. In later seasons, Zoot would become more mellow and quiet since Dave Goelz tended to agonize over the delivery of Zoot's lines. He saw Zoot as someone who best expresses himself through the saxophone. 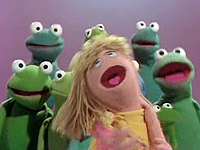 The final number incorporates a chorus of Muppets gathering around the guest as he sings, providing backup. This would typically be done throughout the show's run and often allow some of the show's "non-performers" like Hilda the costume lady and George the janitor opportunities to come onstage. "Another great moment to watch for is Bunsen Honeydew's first appearance. (A clip of Bunsen's first sketch.) You'll see that he's on his own and he's not with Beaker. Beaker didn't actually join the show until the following season. 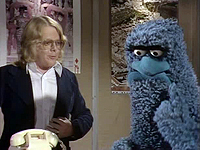 Here's Bunsen and Paul Williams in The Muppet Show." Fozzie's joke: "New York is so crowded, even the cemeteries have standing room only!" 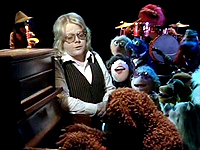 Kermit promises to not make fun of Paul Williams' size even though they will be making him an honorary Muppet. MUSICAL NUMBER: "ALL OF ME"
Fozzie, wisely lacking confidence in his monologue on the War of 1812, lets Scooter talk him into doing the classic Telephone Pole Bit. 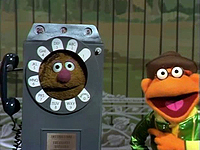 There's just two snags; it's a duo scene with Scooter and Fozzie's playing the telephone pole. Kermit introduces "one of the most talented people in the business, Mr. Paul Williams." MUSICAL NUMBER: "OLD FASHIONED LOVE SONG"
WALDORF: He's a credit to his race. WALDORF: One hundred yard dash. STATLER: Yeah, but they can't put a moon on a man! 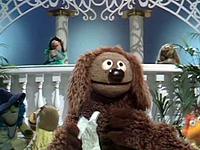 Rowlf recites an ode to "Silence", which in typical Muppet fashion becomes quite loud as other Muppets wander onstage partaking in the activities alluded to in the poem. Paul admits he has a special motive for being on "The Muppet Show"; so that he can be the tallest person in the cast...but then he meets Sweetums, Thog (from The Great Santa Claus Switch and The Muppets Valentine Show), and a Mutation. 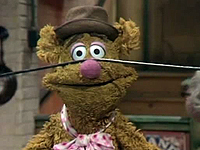 Fozzie, unsure what to expect, practices by method acting as a telephone pole. Hilda doubts anyone would confuse a bear with a pole until an electrician lays telephone wire over his nose. GEORGE: I'll be darned. Ya say that's yer boy? How could ya have a son that age? MILDRED: I didn't. When I had him he was just a baby. UK SKETCH: MUSICAL NUMBER: "I'M IN LOVE WITH A BIG BLUE FROG"
Statler and Waldorf mock the frog chorus' "Grump grop grump grop, ribbit ribbit ribbit's." For a lousy comedian, Fozzie's a very convincing actor - a woodpecker knocks away at his head! Beautiful Day Monster alerts his travel agent (Paul) that he wishes to go to Pittsburgh. When none of the travel options fit the monster's budget, Paul drops a 5000 pound weight on him and mails him off. HOUSE 1: My mother is very religious. HOUSE 2: She's a fanatic? HOUSE 1: No, she's a church. Sam brings on "my kind of people, Wayne and Wanda." As Wayne saws Wanda in half, she attempts to warble "You Do Something to Me". The Newsman interviews retired shoe salesman Arnold Stockton (Paul) about an extraordinary event which turns out to be a total non-story. Fozzie, having just learned what the Telephone Pole Bit is, is convinced the pair will die onstage, a paranoia further confirmed by the vultures lurking about backstage. Kermit introduces the comedy classic. SCOOTER (wearing Fozzie's hat): Hello, and what's your name? FOZZIE (in pay phone costume): Mike Oznowiski. SCOOTER: Oh, so YOU'RE the telephone pole! STATLER: Good ol' Fozzie, he's never been better. Backed by Rowlf on piano, Floyd on bass, Animal on drums, and Zoot on sax, Paul sings his hit with a chorus of Muppets. Paul assures Kermit he loved every minute of the show until the big monsters come back out. WALDORF: This show is good for what ails me.